This tour features a good deal of coach travel and visits to remote regions in Newfoundland and Labrador. There will be considerable walking over uneven surfaces. Please note that some of the hotels, while clean and comfortable, are relatively simple and rustic. Magnificent scenery, historical landmarks, quaint villages and friendly people; this tour has it all. 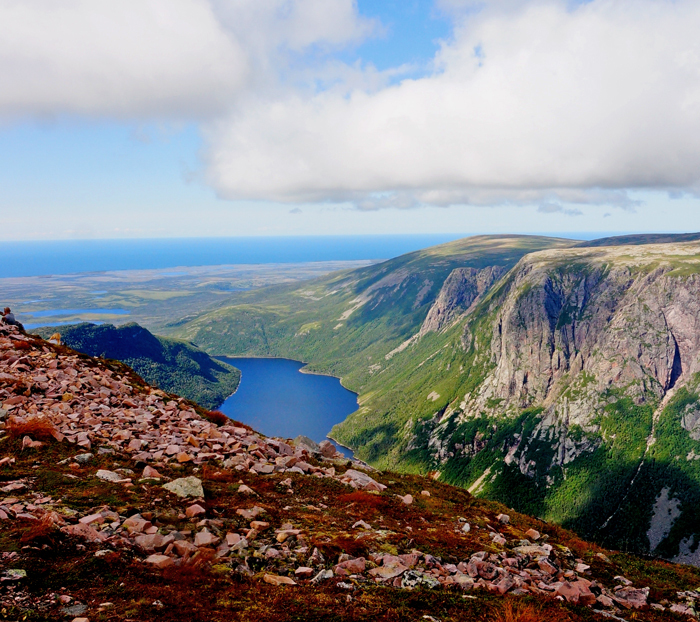 There are a host of exciting places to visit and to enjoy, from the historic sites of St. John's to the rugged grandeur of Gros Morne National Park; from the stark landscape of Labrador to the quaint out-ports of Twillingate and the island’s north coast. 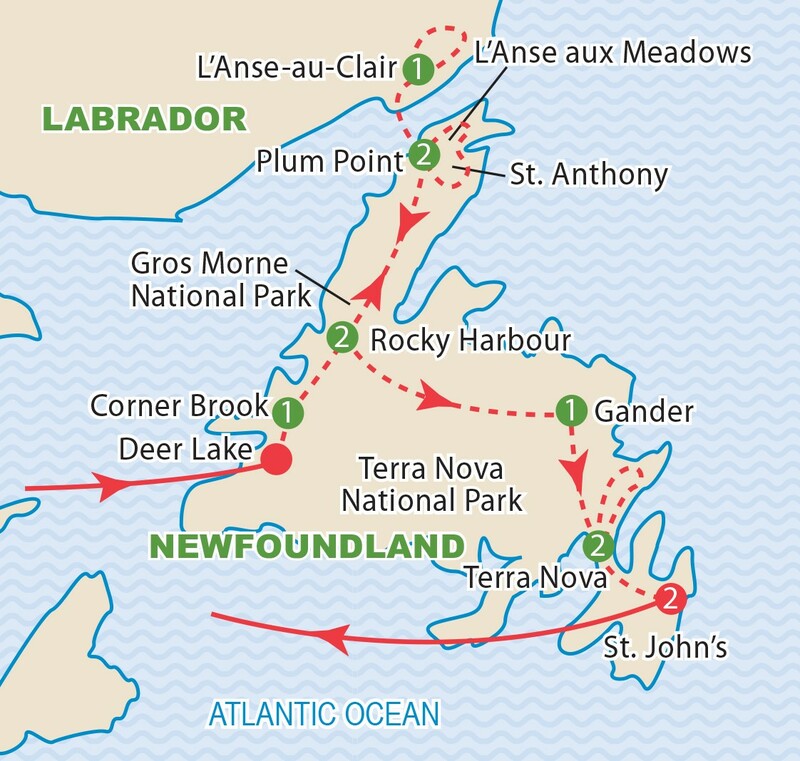 This itinerary emphasizes the diversity and byways of Newfoundland and Labrador. As with all of our tours, we look after every travel detail. Your inclusive price covers most meals, great accommodations, all sightseeing, all gratuities, taxes and even the applicable HST. Once again we are operating this program in conjunction with McCarthy’s Party, a family based operation in St. John’s which has been welcoming visitors to Newfoundland for more than 30 years. They know the island best and will ensure a very warm welcome. Limited availability, only 3 rooms left. Book soon! Today we travel the coastline to St. Anthony to visit the home of the famous medical missionary, Sir Wilfred Grenfell. The highlight of this day is our visit to the UNESCO World Heritage site at L'Anse aux Meadows, home of Leif the Lucky and the Vikings who settled this area as early as 1000 A.D.
Today is devoted to Gros Morne National Park. We travel to the south side of the park where we visit the new Discovery Centre and view the famous Tablelands Mountains. It is this area that earned the park its UNESCO World Heritage status and its nickname as the “Galapagos of Plate Tectonics”. We take a water shuttle across Bonne Bay where we learn about the geology of the park and the unique culture in this area. This morning we are off on the “Road to the Isles”, across “Tickles and Runs” to enjoy the beautiful Twillingate Island. 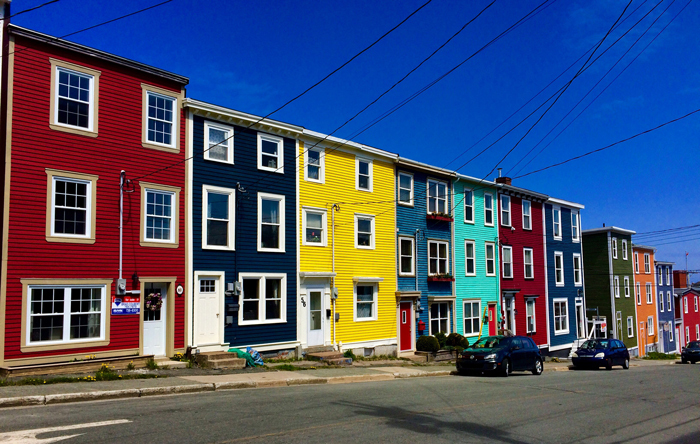 This is one of Newfoundland's oldest and most interesting fishing communities. We then travel to Terra Nova National Park to view the vistas of Newman Sound. This morning we travel to the historic village of Trinity, one of the oldest communities in North America, the gem of the Island. 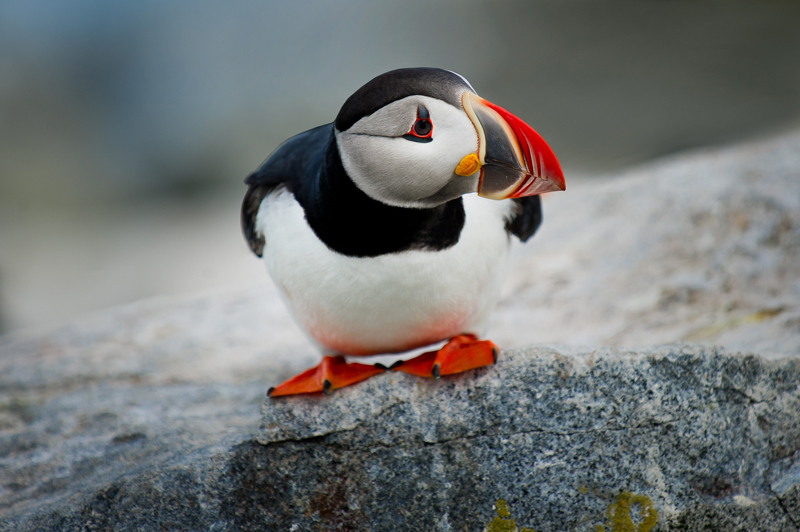 Then it’s out to Cape Bonavista for a chance to walk the cliffs and enjoy the spectacular coastal scenery. This afternoon is spent in Bonavista, the landfall of John Cabot in 1497. Here we visit the Ryan Premises and have an opportunity to learn from the locals about inshore fishing techniques that have allowed this town to thrive for hundreds of years. 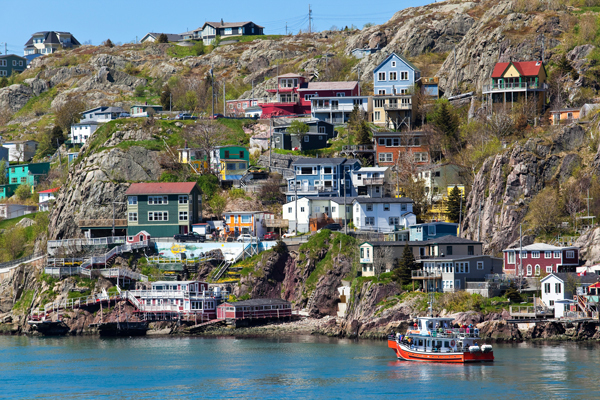 This morning we will tour historic St. John's, the oldest city in North America. 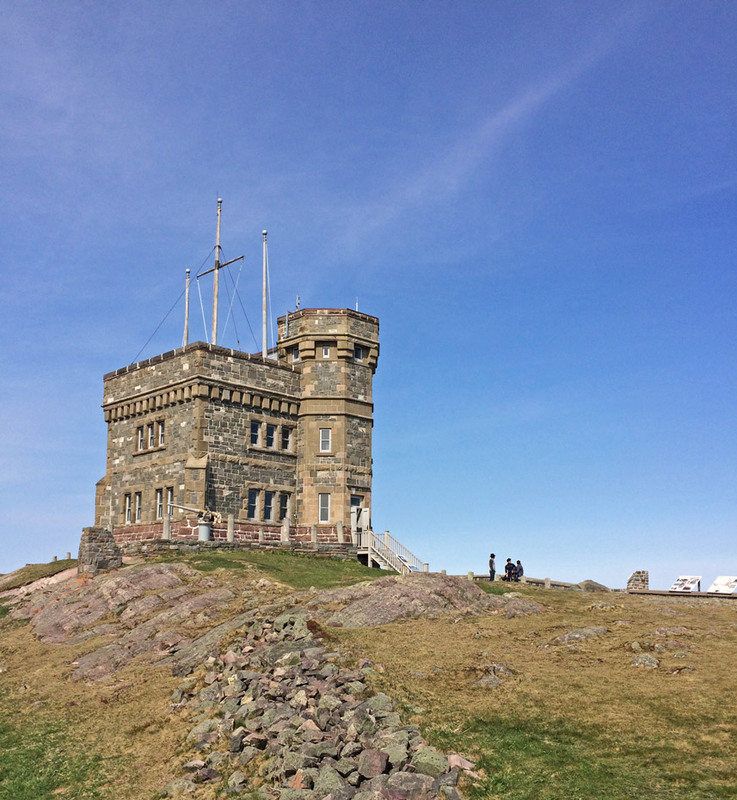 Included is a visit to Cabot Tower and Signal Hill where we can view the famous ‘Narrows’ and admire the architecture of old St. John's. This afternoon is at your leisure for shopping or to explore on your own. This evening we share our Farewell Dinner. After a leisurely morning we gather for our transfer to the airport and our evening flight back to Toronto and our homes across Canada. As we fly homeward it will be with many delightful memories of an authentic Newfoundland experience that will be recalled for years to come. Tour prices are based on sharing a twin-bedded room at hotels and on a minimum 30 members. They are also based on rates, airfares, taxes and fees effective August 2018 and are subject to change due to factors beyond our control. Refer to Inclusive Features for details. Group to be escorted with a minimum of 25 travellers. Prices from other cities are available on request. Prices DO NOT INCLUDE the cost of insurance which is available and is highly recommended. Premiums vary with the cost, length of the trip, and the traveller’s age. For passengers up to and including 74 years on departure date, premiums will range from $245 to $314 pp plus applicable taxes. Cost supplements for travellers aged 75-85 will range from $182 to $355 pp plus applicable taxes. This insurance is effective from the date of purchase and carries limitations on pre-existing medical conditions. Clients 86 years and older and/or clients residing outside Ontario - please contact our staff for procedures. Please discuss your insurance coverage prior to booking. Refer to our Terms and Conditions for more details.